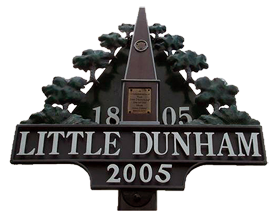 The village of Little Dunham is situated in the Breckland District of Norfolk, some 1.5 miles from sister village Great Dunham, and 6 miles north east of the town of Swaffham. It is a quiet, rural community of some 309 residents, sitting amongst predominantly undeveloped, agricultural land. Little Dunham Parish Council is one of 107 parish councils in the Breckland District which, nestled on the Norfolk/Suffolk border, is one of the largest rural districts in England. The Parish Council has responsibility for a number of local services and amenities, but also consults with other authorities such as the District and County Councils on matters pertaining to the village and its surroundings. Here on the Parish Council website, you will find information on local services and amenities, details of how to get in touch with Council members and, importantly, the scope of the Parish Council’s responsibilities. Many local services, such as planning, policing or conservation are the responsibility of the other branches of Local Government, over which the Parish has no direct control. You will find clear links to these other local council authorities to help you find the information you require.